Need a Photo of Felicia for a flyer or program? Use the ones below. Need one of her performing or presenting? Just ask or check out the photos on this website. 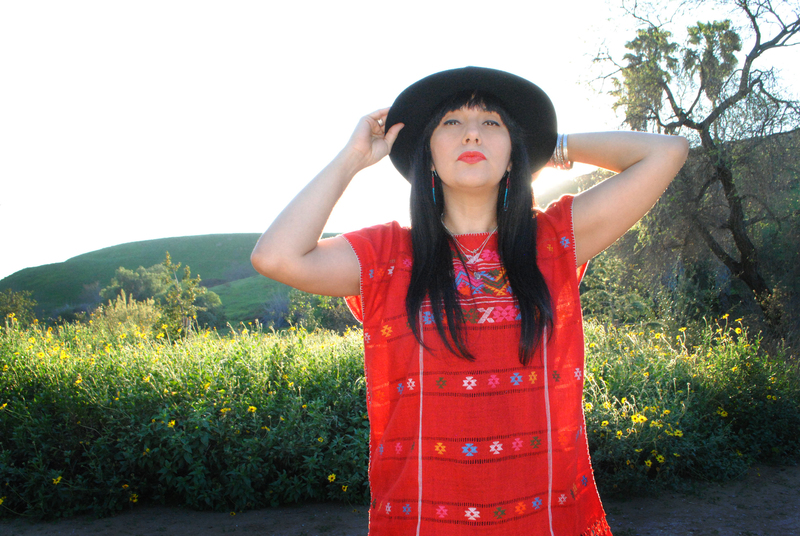 Felicia Montes is a Xicana Indigenous artist, activist, academic, community & event organizer, educator, designer, and poet, performer, speaker and practitioner of the healing arts living and working in the Los Angeles area. She believes art is a tool for education, empowerment and transformation and has translated her passion for art and social justice as the cofounder and coordinating member of two groundbreaking creative women’s collectives, Mujeres de Maiz and In Lak Ech. She currently serves as the founding executive director of Mujeres de Maiz. Felicia also creates work based on social and spiritual change as she works on the front lines of activism and organizing. Known throughout the southwest as an established Xicana cultural worker of a new generation, she has worked with most of the key arts and cultural centers and social service agencies in the greater East Los Angeles area including Self Help Graphics, Proyecto Pastoral and the United Farm Workers. She has been influential in Los Angeles transnational art and organizing efforts including work with the Zapatistas, Peace & Dignity Journeys, and La Red Xicana Indigena. Felicia ‘Fe’ Montes is a Xicana Indigenous artist, activist, community & event organizer, educator, emcee, designer, poet, performer & professor living and working in the Los Angeles area. She believes art is a tool for education, empowerment and transformation and has translated her passion for art and social justice as the cofounder and coordinating member of two groundbreaking creative wombyn’s collectives, Mujeres de Maiz and In Lak Ech as well as the online mercado for the movemynt, Urban Xic. She currently serves as the founding executive director of Mujeres de Maiz. Felicia creates work based on social and spiritual change as she works on the front lines of activism and organizing. Known throughout the Southwest as an established Xicana cultural worker of a new generation, she has worked with most of the key arts and cultural centers and social service agencies in the greater East Los Angeles area including Self Help Graphics, Proyecto Pastoral and the United Farm Workers. She has also been influential in Los Angeles transnational art and organizing efforts including work with the Zapatistas, Peace & Dignity Journeys and La Red Xicana Indigena. Felicia has both organized and performed in hundreds of cultural events, conferences, classrooms and protests for many artists and social justice causes for almost two decades. She has performed across the Southwest, Colombia and Mexico including Chiapas, Mexico City and Oaxaca. She has published poetry in the book “Fleshing the Spirit” as well as the Mujeres de Maiz yearly art and poetry publication since 1997. In 2011, she self-published her own poetry book titled “Ten Fe” which features her poems and performance pieces. Felicia is currently working on her album, which will feature spoken word, floetry and hip-hop. In addition, she has a published essay in the book “Rushing Waters, Rising Dreams” as well as being interviewed for a forth-coming essay about her self-named FE clothing line. Felicia also creates visual and multimedia art and performances including silkscreen, installation and performance art and has exhibited both individual and collective work at places including 18th St. Art Center, Vincent Price Museum, Self Help Graphics and other East LA cultural centers. As an educator, Felicia taught for five years as a substitute teacher within the Los Angeles public school system. She has taught Chican@ Studies courses at UC Santa Barbara and East LA College and is also a lecturer and keynote speaker at campuses across the southwest including UCLA, UT San Antonio, UC Davis and more. As a healing arts practitioner, Felicia is an apprentice of Western Herbalism, a Reiki 1 practitioner, and studies and practices Mexican Traditional Medicine and Indigenous dance. Since 2000, she has supported and helped coordinate the Los Angeles region Peace and Dignity Prayer Run. She creates altars and has helped to create Day of the Dead ceremonies and festivals based in the Aztec and Chicana/o artistic and spiritual tradition since 1997. In addition she facilitates monthly women’s talking circles every full moon since 2010 based in the Aztec and indigenous healing circle. She also is a trained facilitator of the Xinachtli, young women’s rites of passage circle and will be starting circles in the East Los Angeles area soon. As a poet, singer and drummer of In Lak Ech, the Xicana Indigenous drum and song group, she has helped to facilitate opening blessings and prayers in many spaces. Felicia holds a B.A from UCLA in World Arts & Cultures with a minor in Chican@ Studies and a M.A in Chican@ Studies from Cal State Northridge, and a MFA in Public Practice Art from Otis College of Art & Design. With these papers, her clothing line, her performances and decades of work she has reached many communities and circles across Aztlan and beyond with a message of wombyn and Indigenous empowerment through art and activism.